Note: this post contains an affiliate link to the Truth in the Tinsel eBook. For the past 5 years, our family has been enjoying a wonderful Christ-focused Advent countdown called Truth in the Tinsel. It is created by Amanda White who blogs at OhAmanda.com. I have been following Amanda and reading her blog for years. I admire her passion for bringing Christ into the lives of children in a meaningful and fun way. 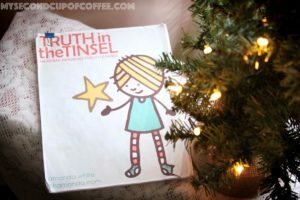 When my kids were old enough to understand and answer some basic questions and do fun crafts, we went out and purchased the eBook “Truth In The Tinsel”! I printed it out, and since that first year we still use that same print-out to this day. This Christ-focused advent countdown has been our go-to Christmas resource for many years!